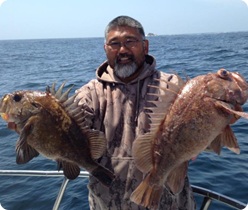 The Sea Wolf crew specializes in Rockfish/Lingcod and Rockfish/Dungeness Crab combo fishing trips and we are committed to providing a quality experience no matter what your skill level. Personal service is a priority, along with a Coast Guard inspected boat, well-maintained equipment, and state-of-the-art electronics. For your comfort, we limit our passenger loads and are always eager to assist in whatever way we can to make your day fishing a memorable event.